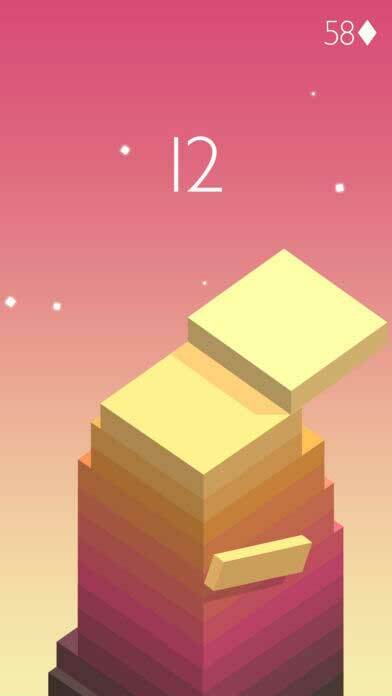 Are you a fan of the awesome game Stack by Ketchapp? With an approximated 50,000,000 downloads on Android and who knows how many more on iOS, today we’ve got the best Stack “update” you will ever experience! 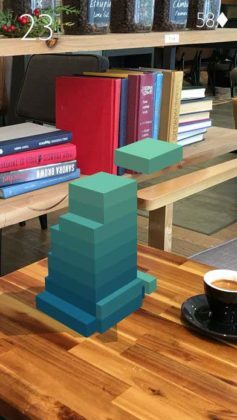 …Stack in AR…! 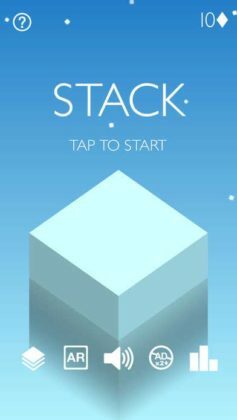 In order to play Stack in AR, you will need an iOS device capable of running the latest version of iOS11. If you’re on Android we would advise you stop reading about now so as to prevent your jealousy from exploding! Now that we’re all good, let’s continue. 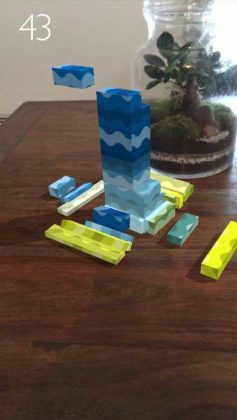 After launching the game and selecting “AR Mode”, (something we neglected to do in our excitement the first time we played), you will be prompted to move your device around the room until a suitable flat surface is found. If you are experiencing difficulties finding a suitable surface, what we’ve picked up playing iOS 11 AR games so far is that lighting seems to be the key. Make sure your room is relatively well lit before you give up because it is 100% worth it. Once you’ve found your perfect spot, the game is on! Played using the exact same gameplay system as the original version of Stack we are all by now far too familiar with, playing Stack in AR is easy thanks to a useful new feature that cuts your tower down once it reaches 10 blocks in height. If you were worried that with your level of skill you would need to play this game on a ladder you for one – are a narcissist – but luckily don’t have anything to worry about. 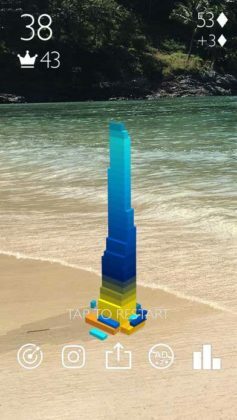 Once your tower has reached its limits and you inevitably Game Over your full-sized tower will rise out of the floor, bench, stool, or whatever else you happen to be playing on, allowing you to see the size of your completed tower in real life! More than a little awesome! If you are still reading this you are one faithful follower of Edamame Reviews. Stop reading this review now and download Stack AR! It isn’t an update, you will actually need to download a new game!